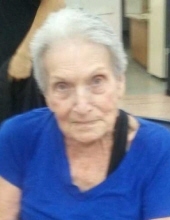 Thelma Jean Sigford passed away peacefully on March 26, 2019 in Willis, Texas. She was born on June 5, 1928 in Madisonville, Texas to William and Lillie Baker. On November 8, 1948, she married the love of her life, Edward Walter “Eddie” Sigford, Sr., who passed away in July of 1998. They had three sons; Edward Walter “Codroy” Sigford, Jr.; along with twins, Kenneth Melvin “Tot” Sigford and Michael “Kelvin” Sigford. Along with being a loving wife and mother of three boys, Jean worked on millions of tiny mirrors for industrial government companies, which led to helping NASA by improving the Hubble Telescope with her tiny mirror techniques and received a prestigious award for her involvement. She and Eddie moved to Willis and opened Eddie’s Pawn, which was Montgomery County’s first pawn shop and they later opened a well-known bar outside of town called The Oggo. Thelma Jean Sigford was a very simple lady who at times could be very stubborn in her ways. No matter what life had given to her, she always tended to make-due with what she had. She is survived by her three Sons, Codroy, Tot and wife Carol Sigford, Kelvin Sigford and significant other Lynn Goodrum, Grandsons; Steven Sigford, Justin and Bridgit Sigford, Jared and Bridget Sigford, and Jacob Sigford; Great-Grandchildren, Nathan Sigford, Sadie Sigford, Chloe Schultz, Kylee Schultz, Caleb Schultz, Andrew Herren and Emily Herren. Many cousins, other relatives, and friends are also survived. She is preceded in death by her husband Eddie, grandson, William Robert “Billy Bob” Sigford; Siblings, Opal Baker Hightower, Bill Baker, and Ben Baker. Known as Mom, Granny, or Ms. Jean, she will be missed by those who knew and loved her. To send flowers or a remembrance gift to the family of Thelma Jean Sigford, please visit our Tribute Store. "Email Address" would like to share the life celebration of Thelma Jean Sigford. Click on the "link" to go to share a favorite memory or leave a condolence message for the family.